Truck games have become quite popular especially after the arrival of realistic simulators as the series “Euro Truck Simulator”. But the genre has been explored by several other games through the ages. 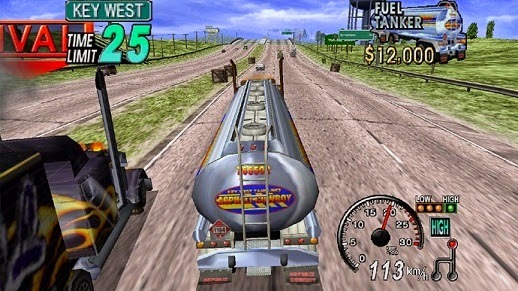 Check out some of the most famous truck games ever released. This classic arcade of Sega has many similarities with Crazy Taxi, as it uses a common profession and introduces exaggerated elements to make it more fun. 18 Wheeler, you need to deliver cargo through relatively simple paths, away from traffic and taking advantage of the vacuum left by the cars to gain speed. However, there is a trucker insane competitor will try to hinder you along the way. Euro Truck Simulator 2 is ideal for those looking for a truck simulator. In addition, the game offers the opportunity to start from scratch - just driving vehicles and delivering loads. But that's not all. The gamer can even join enough to buy his own truck and perform any kind of work through various famous cities. The title still remains updated with several DLCs adding new cities and trucks. While 18 Wheeler appreciates the player's skill in avoid obstacles and avoid trouble, Big Mutha Truckers just invests the opposite: the politically incorrect. You will be in the role of a truck driver who tries to inherit the family business. For this you will need to confront dangerous roads, gaining bonuses to eliminate other cars and needing to deal with police and motorcycle gangs. The version of Big Mutha Truckers consoles was reasonable, but little striking about the technical point of view. In the GameBoy Advance, however, the title tried to innovate with technology that had beautiful 3D graphics for the laptop. This allowed the issue to stand out among the other titles of the time. Super Trucks Racing brings heavy racing vehicles that should not be confused with Formula Truck. With trucks and real drivers of various teams, much of the gameplay focuses on cool your brake system with water, limited resource and whose administration will determine its performance. Of all listed securities, Big Rigs is the only one that became famous because of the very low level of quality. Even the title was often considered one of the worst ever produced. In theory, it would be a game about making deliveries, but there is no load on your truck. There are other vehicles that apparently would dispute a race with you, but they do not move. The scenario is even an obstacle. So you just go through the objects.